A row of hero-stones with Halegannada inscriptions. Two women in long skits and sunflower like headgear attending to a man seated on a raised platform. The man seems to be levitating. 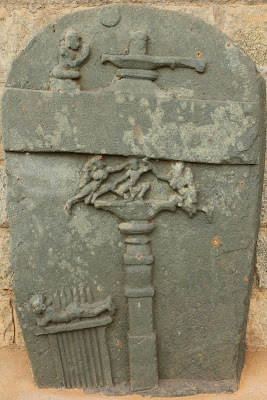 Top portion of a hero-stone; Shivalinga surrounded by Sun, Moon, a holyman and Basvanna. 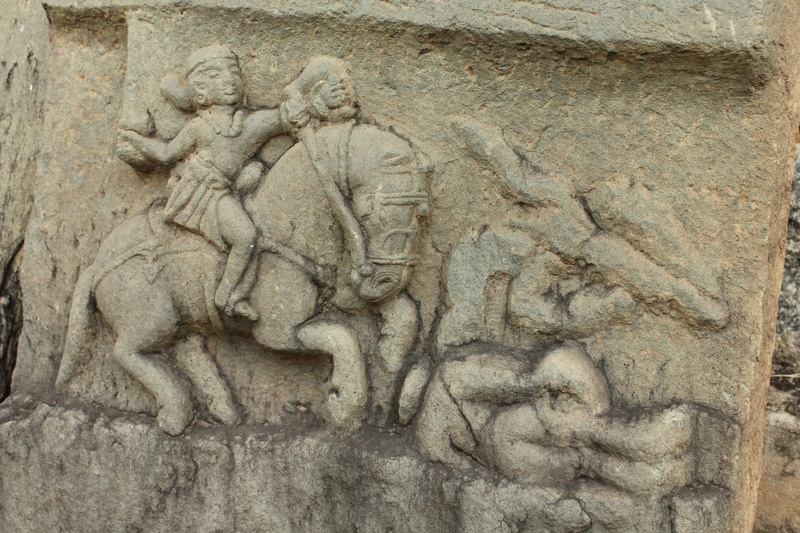 A battle scene; warrior on horse-back and a injured/slain warrior lying on ground. The birdle on the horse's head caught my attention. Another battle field scene. 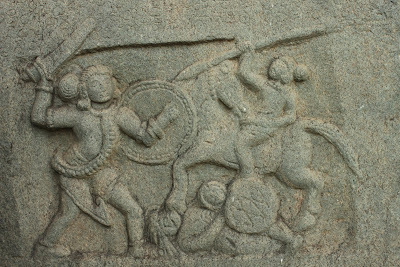 A warrior brandishing a sword & shield engaged in fight with another warrior on horse back with a spear. A third warrior ether injured or slain lies on the ground. More battle scenes. One of them shows cattle, currency of those days. 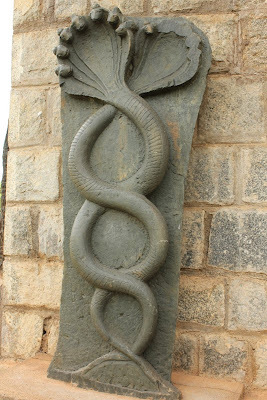 A pair of entwined serpents with seven heads each. A hero-stone with a different design. The top portion is decorated with a shikhara, couple of mystical creatures and floral decoration. 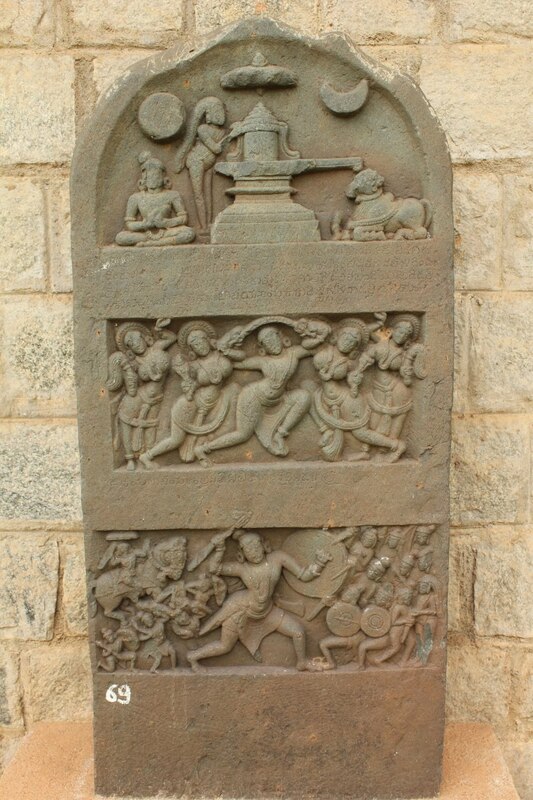 This five-paneled hero-stone has as many stories in it. 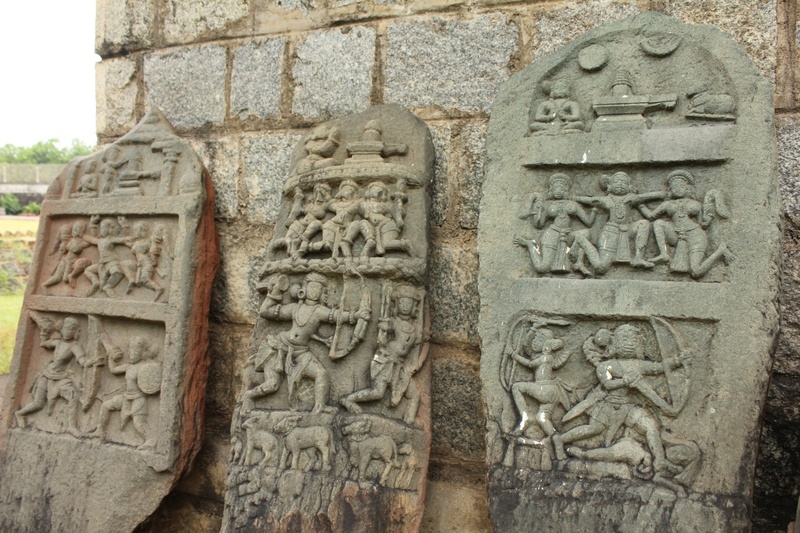 First panel depicts worship at a temple. Notice how smartly the sculptor has utilized space by adding an extra character below the bottom left corner of the top-most panel. Second panel could be a pre-wedding procession. 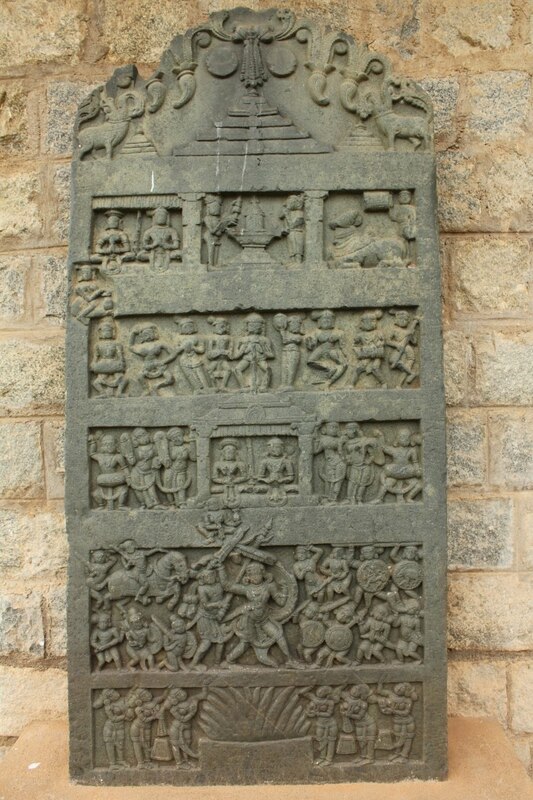 Third panel is the wedding scene, the couple seated in a mantapa. 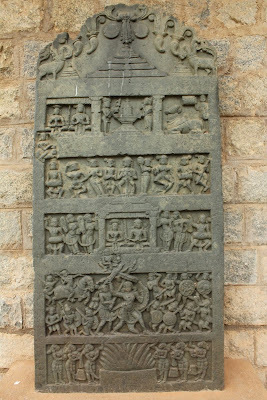 Fourth panel could be post-wedding procession. The fifth panel shows women throwing in offerings to holy fire. 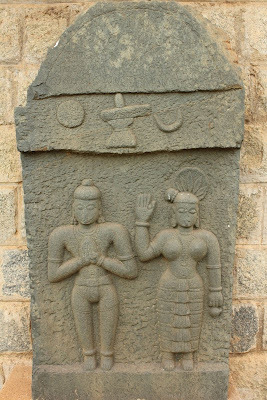 A similar image can be found on the Kedaresvara temple. Both man and lion have well defined features, especially the eyes. 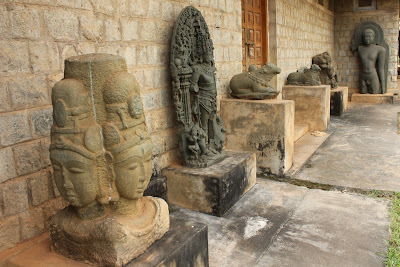 An assortment of sculptures along the front wall of the museum. Seems like a holy couple. The man has broad shoulders and strong arms. The woman's breasts are prominent and arms look strong. Her hair is tied in a bun to a side using a string of beads or pearls. The skirt looks fashionable ...or is it a saree worn in a different style. Both wear jewelry around their necks, on their arms ans legs. I wonder what the lady is holding between the thumb and index finger. Seems like a hero-stone dedicated to a prince. 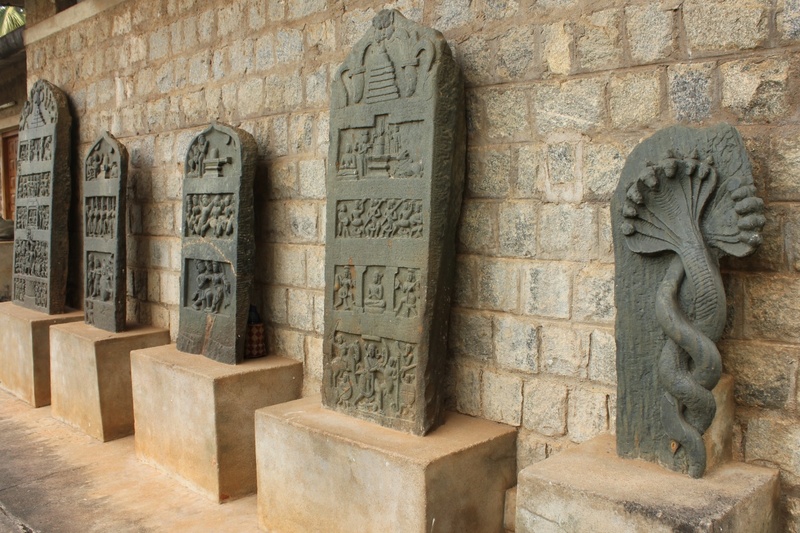 The top panel shows Shivalinga being worshiped by a sage with long hair. A man enjoying female company. 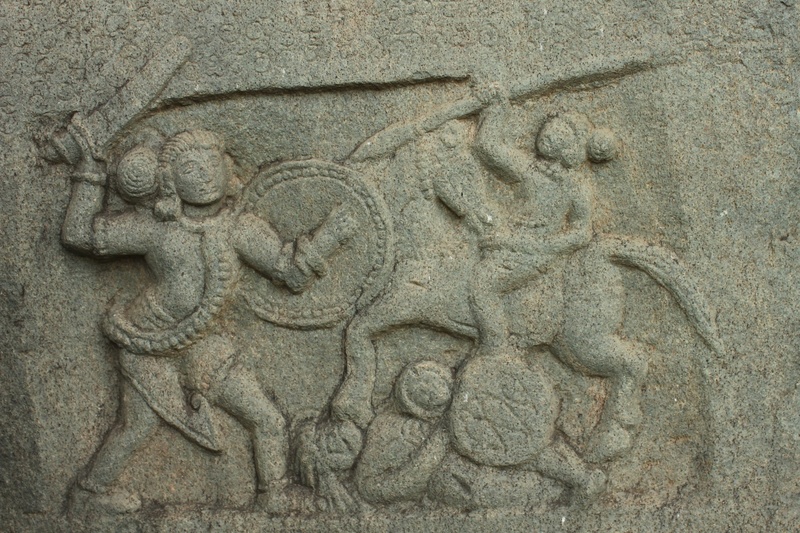 A battle scene. This is something very different. A platform balanced atop a pillar with three characters who seem to be dancing on it. On the ground is a man who seems to be pierced by seven spears or arrows. Couple of entwined serpents, one with seven heads and the other with all its five heads missing. Story of a warrior. 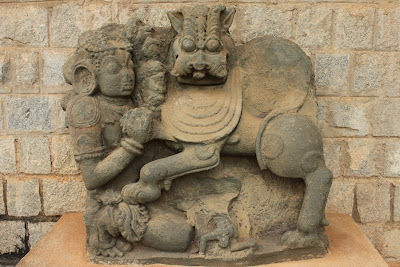 Two female companions attending to the warrior. Characters in this hero-stone sports a unique hair style. The battle scene is interesting; warrior on horse back feuding with foot soldiers. 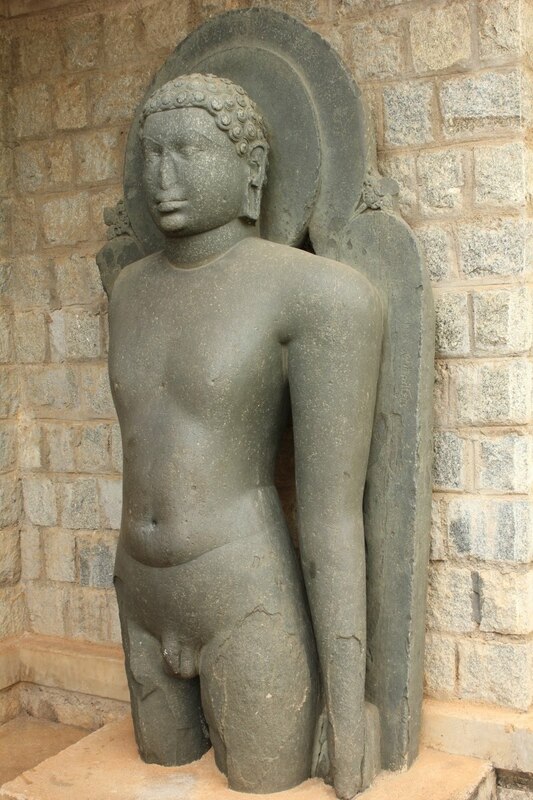 The warrior has worn a dagger around his waist. 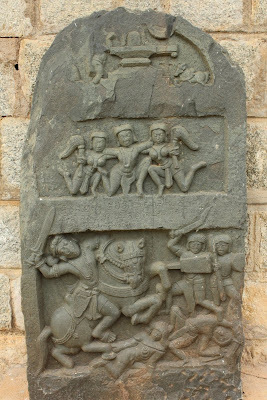 One of the soldiers has a bent sword and trapezoidal shield. The soldier bent backwards seems to have a slash across his abdomen and along his right thigh. 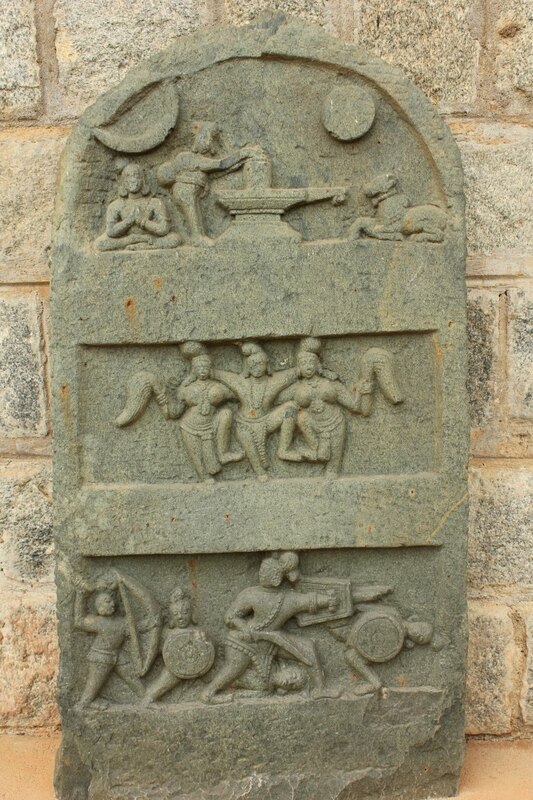 Similar to the previous one, this hero-stone depicts a story of probably another warrior. 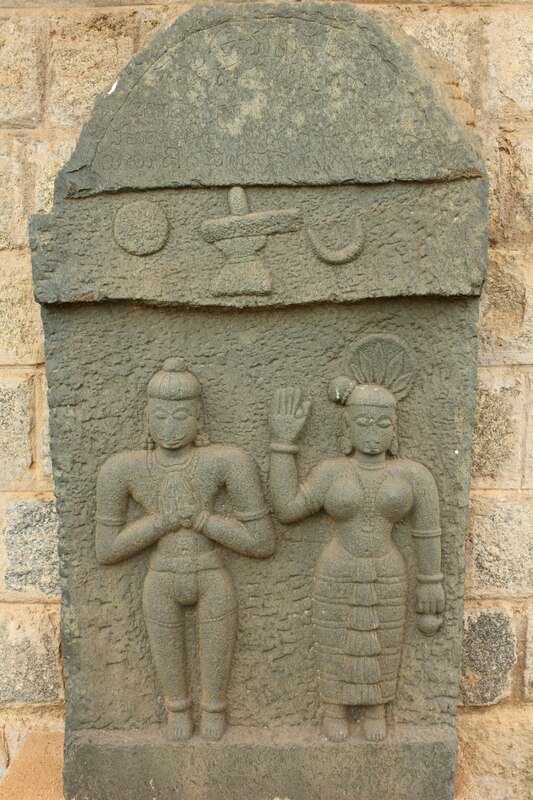 Notice the change in hair styles- long hair tied into a bun on top of the heads. 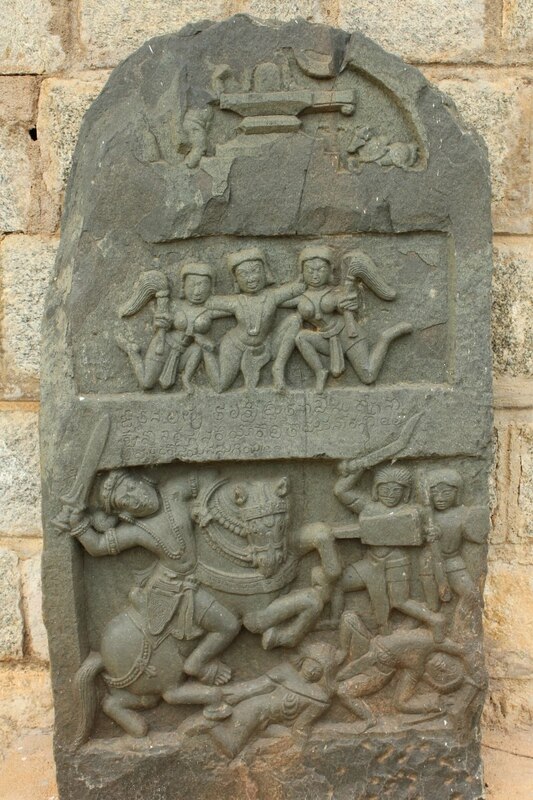 Here the hero is fighting on foot brandishing a bent sword and trapezoidal shield. 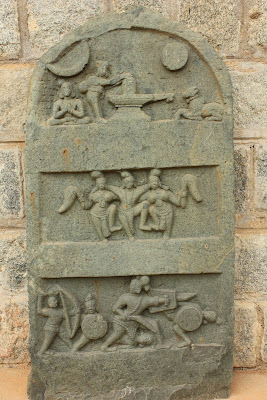 An archer with bow & arrow is also seen. 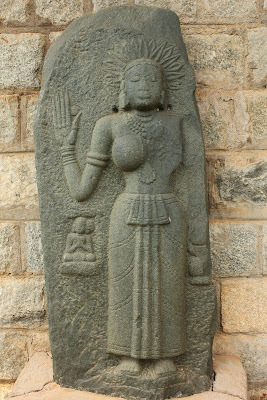 Lady with long pointed fingers, wearing a saree like a skirt with three pleats and simple jewelry around her neck and arms. Her head seems to be decorated with sunflower ...or it could be a lotus in full bloom. There were many more artifacts at the museum, I shot the ones which were unique. I might have missed out a few good ones. My regards to the sculptors to created these wonderful objects of art which tell stories and lets us have a glimpse of life back those days. 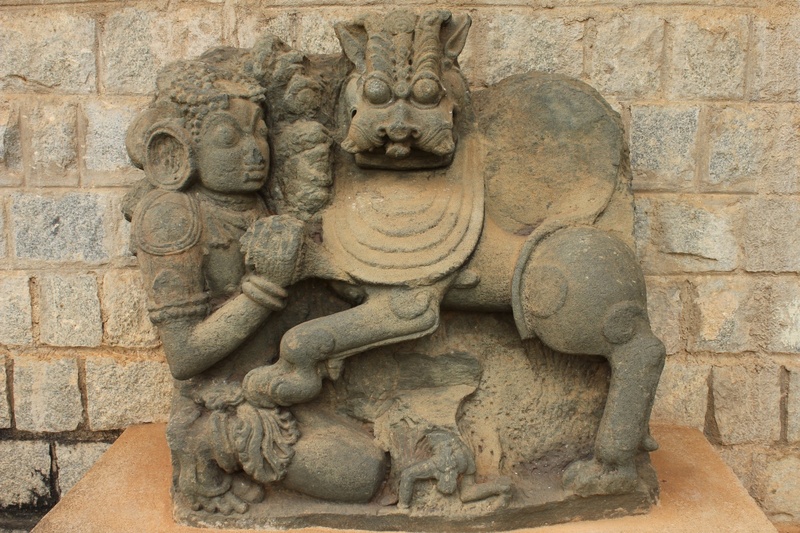 I think the sculpture of man and lion is that of Sala (....master throws a weapon towards sala and shouts ‘Hoy Sala’, which means ‘Kill Sala’, instructing him to kill the Tiger. Sala later went on to found the Hoysala Dynasty).